Confidence comes from evidence. That’s obvious. Or is it? Doesn’t it take some confidence to produce the evidence in the first place? Sure it does. So what is it? 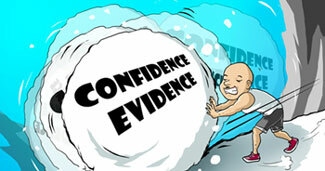 Does evidence lead to confidence or is it the other way around? Indeed, like the chicken and egg quandary, the relationship between confidence and evidence is a confusing one. Being successful in anything– whether it’s sports or academics; speaking in front of a class or asking a girl out– requires confidence. This confidence, furthermore, can only be gained once you’ve proven to yourself that you can do it, whatever it is. In the beginning, this is very difficult. You rely almost solely on blind faith and a belief concentrating on the process, on modeling the behaviors and actions of others who have been successful, will lead to similar achievement. But it’s hard. Very hard. Pushing the metaphorical boulder–or big snowball– from a standstill can seem impossible at times. You push and push and nothing. You use your arms to push. You use your legs to push. You run and jump on the big snowball. Still nothing. The snow-covered boulder doesn’t even budge. You almost want to give up. But you don’t. You regroup, going back to the drawing board after each lesson learned, disguised effectively as failure. Then one day it happens. The big bad rock nudges a little. This is invigorating, re-energizing you and your efforts. As a direct result, you put more focus and time into preparing and working, knowing for sure now that the effort you put forth will lead to success. And it does. The snowball moves more and more, faster and faster. Each increment of confidence produces additional results. This evidence, in turn, makes you even more confident. The increase in confidence, you guessed it, leads to even more success. And before you know it, you are “in the zone”, as they call it. The snowball is moving so fast now that you hardly have to push it. The momentum it’s built is self-energizing, running almost on auto-pilot. All that is required from you at that point is to give it the additional push that is needed when the propulsion is temporarily slowed- such as a rock or tree in the way, or a slight uphill grade that temporarily interrupts the momentous decent. What does all this have to do with you or me? What does a boulder or rock or freaking snowball mean to my life? Well, again, it’s a metaphor for the hurdles that you and I face in our journey toward the goals that we set for ourselves. When you set out to accomplish something that is important to you, you will inevitably find it challenging, especially in the beginning. Especially when it is something at which you are new or have had limited success. In the early stages, you have to scratch and claw to find something to hold onto to keep you going. Maybe you didn’t give a perfect speech, but you were not nearly as nervous in the beginning of it as you had been in the past. That’s positive growth, just one brick–but a brick nonetheless– on which you can build confidence. You are encouraged, furthermore, by chronicles of other speakers who have had similar hiccups along the way. That’s another brick. Maybe you’re trying to become a better basketball player. Well, after trying and trying for weeks, you can finally do that move you’ve been working on. You haven’t done it in a game yet, but still, that’s a brick you can use to build confidence. This process of building, of laying brick upon brick, is applicable to anything you do. Anything. The ability to stay the course– even when it takes a long time to lay the first, second, and third brick-is what winners possess. Stick-to-itiveness (yes, that is a word; look it up) is a requirement if you want to make it in this life. In your career. In the sport you play. In your role as a parent, spouse, manager, or community leader. One Response to Winners know how to (and that they must) push boulders! And push that boulder off your foot should it roll a bit backward. Then continue the forward push.